Was it? I've never got around to reading the Sonic X comic... nor did I finish watching all of the show. What is that sound? No, really—what on earth is that noise? Waitaminute… is that the sound of go-karts??? IT… IT—IS! LET THE RACE BEGIN IN “EVERYBODY’S SUPER SONIC RACING” PART ONE! (IS THE CAPS LOCK STILL ON, OH WAITAMINUTE, there we go. Much better.) 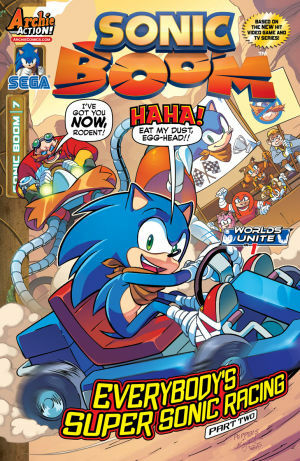 When Dr. Eggman sponsors a go-kart race around Sonic’s Island home, you know that dude is up to no good. The rules are as follows: no special powers, no weapons, and everyone has to drive a kart to keep things fair. Since when does Eggy care about “fair”? What will happen to throw this race into a SPIN? How many rhetorical questions can we ask in one paragraph of solicit text?? Find out in this hyperbole-packed issue! 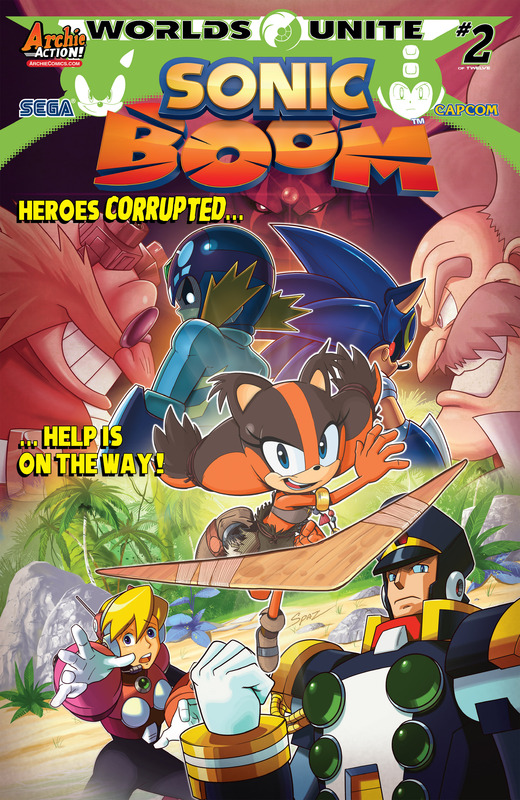 Featuring cover art from Sonic comic extraordinaire Tracy Yardley, plus a new BOOM-Crew Sega art variant! That.. has to be the most disappointing variant cover yet. They've just squashed the boxart for Rise of Lyric and added Sticks. Aside from the terrible variant, I love how this comic is taking every advantage from the fourth wall. A racing story should seem like manic fun for a comic like this and I'm all for that. While the variant was pure laziness on Archie part we finally get a racing arc that will actually take place in real time not like that one sonic universe adaption of sonic & all stars racing transformed that take place somewhere else. So yeah Let the race. BEGIN!!! 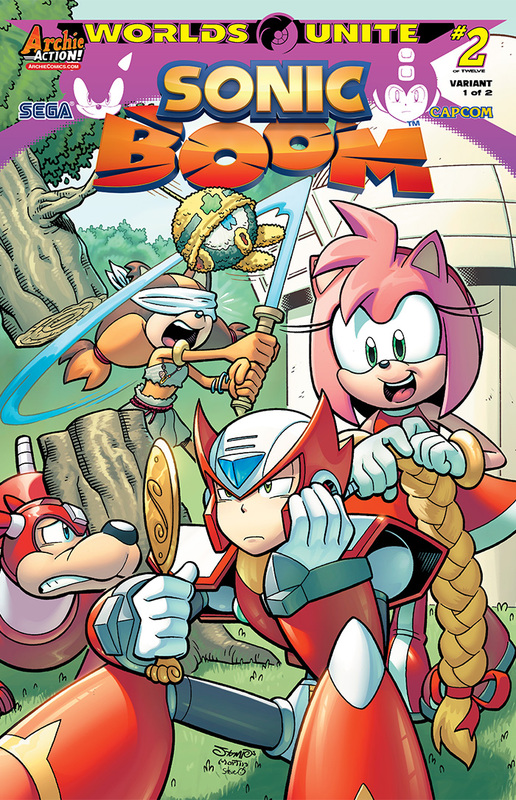 Wow #3 was pretty good but I do question does Amy get more hammer sonic x make it like Amy can magically summon hammers so in this universe does she only have one hammer. I like how cubot made references to Aosth, SatAM, Underground, and X even though he didn't mention their names but their description were pretty accurate. And the best news ever "No dumb knuckles moment" unless you count that one page where they were looking for amy's hammer a dumb moment. At least this time they didn't make Knuckles looks like a complete idiot. With that I was pleasantly surprised.. (unless you DO count that moment when he was searching for Amy's hammer... =-='' ) And at first I didn't actually understand Cubot's reference's (yeah dumb me again :D) But wow.. so many references from so many different Sonic Series.. Also I'm disappointed... So.. Amy CAN'T summon any more hammers? She now has only one? (I mean in Sonic X at least you can clearly see her having more than just one..) I can't say whether that's a good or bad thing though.. so let's say it's neutral. Also Illuminati?! o_o in a comic book made for kids?? (At least last time I checked it was for kids...) Well that was unexpected.. Then again I have seen more and more Illuminati jokes in internet but c'mon... I bet kids won't get this reference. I mean I do but i'm only mentally kid (and proud of it) But I can't really tell if this was a good or a bad story... So I'm going to say it's neutral. Also... Eggman's new design.. Awesome. It wasn't unto sonic x that I though Amy only had one hammer into episode 52 "A new start" that I learn Amy can summon them from out of nowhere she did it in the Archie comics adaption of sonic adventure but I got in it very late. It's wacky-racin' adventure in "Everybody’s Super Sonic Racing" Part Two: Dr. Eggman’s fun and “friendly” go-kart challenge has turned deadly! But, really, who didn’t see that “twist” coming? Can Sonic salvage the race and prove to the bad doctor he can win fair and square? More importantly—can Sonic survive long enough to return to the race course?! Discover the fate of life, limb and ego in this super-fast story with cover art from Sonic comic fav Jamal Peppers, and an all-new "insubordination" variant cover from painter Erik Ly! …And BOOM goes the dynamite! Wow they reference sonic r I though they forgot about that game since it was a hit and miss title. They addressed the whole 'why does he use a car' thing in one of the off-panels. Basically, to keep things fair for everyone else. 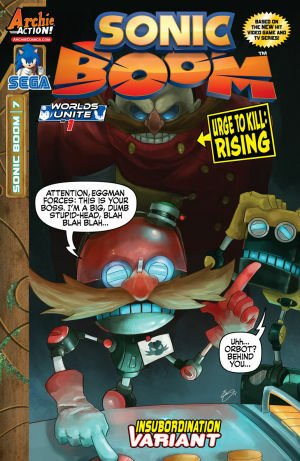 As for why he doesn't break the rules when Eggman does? Well, what sort of example would that be setting the young kid readers the comic is aimed for! You need to show the kids they must always play fair because the secret cabal controlling the world won't! I was referring to Sticks mentioning the Illuminati last issue. Basically making a joke about how they're mixed up at who this comic is targeted at. So Sonic and friends (minus Sticks) are having… what I guess is lunch since Eggman has a clock showing either 1:30pm or about 6:05pm when out comes… EGGMAN! In the same contraption that he’s been in for the past 4 issues. Is this the only thing he can build? Or actually… the only thing his robots can build? 3 is the standard in this circumstance. Anyway… so Eggman is unhappy because Sonic’s team… forgot to show up to their battle? 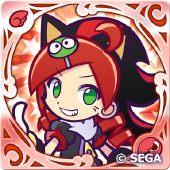 Uh… tell me Eggman… why didn’t you go cause havoc with your robot? That usually attracts the heroes to save everyone. Also… what evil villain sends the heroes BIRTHDAY CARDS??? 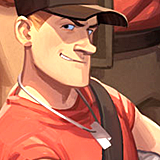 Bombs they may be, but they’re hardly gonna trust anything from you on their birthday. Christmas is the time to do it if you want to be evil. Also, Amy… you complain that a card from Eggman arrives a week late but you don’t care that Sonic forgot to give you a present for your birthday 6 months late and it wasn’t even from Sonic and wasn’t meant for you (see episode 8 of the cartoon). I'm guessing this just means that Sticks is a bit... Different from the rest of the heroes... I mean really The 8 ball of justice?? Aaaaaaaaaaaand.. Still no luck with Knuckles becoming smarter.. But at least this time they didn't embarrass him as much as they usually do.. So that's something I guess.. Eggman sending them all Birthday cards? xD That's cute! I guess his more like Sonic X' villain then? Not really brutal or anything but just doing this for fun. More like a frenenemy to them. I've also noticed that Amy has become more of a douche (at least to Knuckles though she did apologize) and now they're bullying poor Tails! Still not seeing much jokes about Sonic... Sure he's the hero but they could embarrass him a little too since they've already done so with the rest of the heroes. And here's the Boom side of things! Maybe this blender will have some fun moments. This Variant Cover is just amazing. It is a masterpiece.